Imagine if this knife were real...now you can begin training. There are an endless number of martial arts styles, schools, organizations. All of them, on some level, claim to teach self-defense but few really do. The question is: How do we keep it real? We all claim to be the best, some of us know we are the best, but how can we know? and what is our system of checks and balances? How do we keep it real? First I would say that none of us is perfect, or even close to perfection. All we can do, in the words of my teacher, is attempt to minimize damage. Lets be a little bit humble, we offer no guarantees and we certainly do not promise movir type antics where you walk away with hardly a scratch. No, nothing of the sort, we deal with reality. But how do we keep in real. Picture someone you love, someone you really love, someone you would risk your life for, and then ask yourself if you are satisfied with your current technique or approach to save this individual. Are you comfortable with teaching this person your gun or knife disarm? Are you confident it will work for them? (for them, not for Chuck Norris or some other fictional character). Now imagine yourself, with a knife against your throat, feel the fear, feel the anxiety. Will your current technique work under those circumstances? Imagine yourself deep in prayer when suddenly a couple of religious maniacs run into your House of Prayers shouting Allahu Akbar, stabbing with axes and knives and spraying bullets. Are you still comfortable with your techniques? At the IKI lab we test everything with as many people as possible. We want the feedback of our top instructors, we welcome questioning. There is no room for ego. Ego is the shortcut to death. We try our best to test everything in as realistic a way as possible, mimicking as much as possible how a real situation might unfold. Thank God our methods have already saved lives all over the world. Our approach is successful. Over the years I have had to abandon many techniques and training methods that I really liked. I have had to let go of preconceived ideas and leave my comfort zone. I have had to drop techniques that I spent years perfecting. I had to, because I must be honest with myself and with my students. I often look at other styles, even other forms of Krav Maga, and it makes me wonder. Does anyone really think this will work for the average person in a real life situation? What are they thinking. 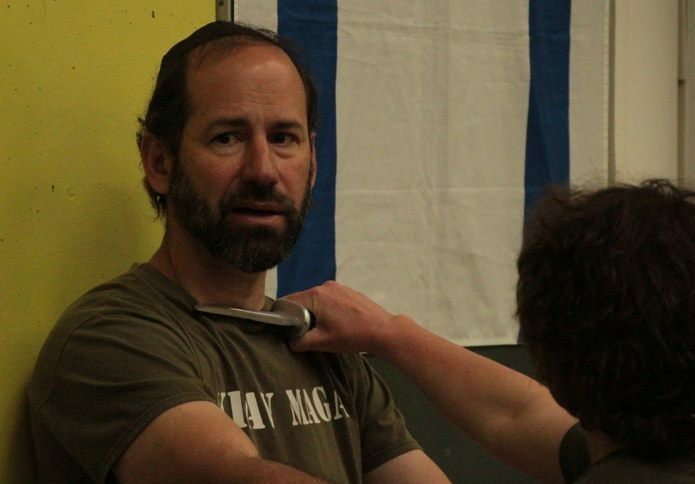 One former member of our organization joined another Krav Maga organization that offered "endings", i.e. knife disarms and other control techniques. He argued that although he knew they were "highly risky" he chose this because he had small children and needed to "do something". Of course we address that issue all the time, and we have solutions, and we offer a variety of possible ways to end an altercation based on ACP - Ability, Circumstances and Purpose. But we will never teach you anything "highly risky". We cannot be so irresponsible with your lives. Everyone will believe what they believe and often there is little one can do to change it. Our ancestors advised us to prepare for our enemies by "Peace offerings, combat preparation, and prayers". Some of us put more emphasis on prayer, some prefer the peace offerings and some of us train. Most of our current enemies are not interested in peace offerings. Some people truly believe that their techniques will work but I just look at them and shake my head in disbelief and say ...Good luck with that. I do not invest a fortune in our DVDs because I know that in all likelihood I will change them in a couple of years. In fact that has been the case since the founding of IKI; every few years I declare a DVD outdated and we must film a new one, we are constantly seeking to improve, we are never content, after all, it is your lives on the line. And remember, you are at the center of all we do.